One Pretty Little Box: A Sink full of dishes for breakfast! A Sink full of dishes for breakfast! Yesterday evening, as I was spending a few moments online, I began to look for a recipe to use up some apples. I didn't want an apple pie, or anything desserty. I needed a new breakfast recipe. From the time I can remember, I just don't have a "healthy relationship" with breakfast. I don't know why, but as a home maker that is the meal that I struggle with making the most. I found what I was looking for, but after reading several reviews on a few recipes new I would need to take a basic recipe, and tweak it. The result? A fabulous start to the day, and a sink full of dishes for breakfast! Preheat oven to 375* Peel, core, and shred four apples. 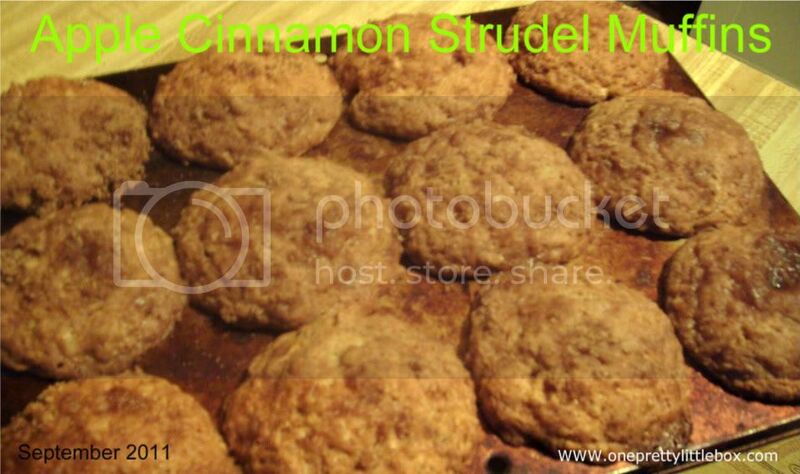 Place in small bowl and sprinkle 1/8 cup of sugar and 2 tsp cinnamon on top. Toss apples and sugar mixture then set aside. In a medium bowl, combine flour, baking powder, baking soda, salt, pumpkin pie spice and mix well to combine ingredients. In a large bowl combine sugar, eggs, melted butter, and vanilla until well mixed. Add apples (and all the juices in the bowl) and mix well. Add flour, and mix until combined. This will be a good and hearty batter. It will not be runny, but you will NOT need to add any liquid. Line a 12 cup muffin pan with liners or spray well with Pam. Using a 1/4 cup measuring cup, place in a full 1/4 cup into each muffin tin until 3/4 to almost full. In a small bowl combine topping ingredients with a fork until well combined (and crumbly). Top each muffin with some of the topping. Bake for 18 to 20 minutes or until done in the center. The end result?! They were well received by all! I had a few left over that I took to the director of the preschool and my co teacher. They both loved them as well. This is a hearty muffin, and very filling. It is definitely a good way to get some fiber in, and a tasty way to get your apple a day! At the end of mixing these up, and placing them in the oven, I turned around and looked. I had a sink full of dishes for breakfast! While some may look at those as a burden, I did not. See, too often there aren't ANY dishes for breakfast but instead a granola wrapper, fruit peelings, or yogurt containers. I spent a good part of my morning in the kitchen, and while I normally would have been grumpy about that ~ I felt it was a blessing for me instead. I just knew those muffins would be well received by my children. I finally felt like I had started their morning off in a way that truly showed them they are a blessing to me and not a burden. I found joy in doing a sink full of dishes for breakfast! I found joy and a fulfilling meal ~ out of serving my family and not myself.